My next column is available at InsideCounsel, which explores the emergence of the Office of Technology Counsel. I've been hearing and indeed have engaged in more and more discussions in the legal market about how most companies are still nowhere near where they need to be in their litigation readiness. While it is improving somewhat, slowly, and likely under the pressure of sanction avoidance, the lawyer/IT gap is still a major challenge, as is the capacity of their interdisciplinary teams to handle both their regular day jobs along with these increasing duties. "In short, this office’s mission is to transform the organization from one of reactive fire drills and ad hoc processes into a well-oiled machine to enhance repeatability, accountability, predictability and overall risk management. When done well, this translates into enhanced defensibility." The article includes a bullet list of related duties, some caution when developing the Office's reporting structure, and help on where you can find a suitable Technology Counsel candidate. What's New in Cordless Mice? Not counting BlackBerries, many mobile legal professionals are toting a notebook as their primary computer. In doing so, it's sometimes easy to overlook some of the essentials, such as a good travel mouse. Touchpads and eraser-head "pointing sticks" have their place, but there are still definite productivity and ergonomic advantages to be gained with a well-designed cordless travel mouse, especially if you do any work with images and presentations. I was recently in the market for a new notebook mouse, and definitely wanted to avoid anything with cables. I haven't done a gadget review in a while, so I had some fun with this one. With the holidays upon us, a good cordless mouse could make a nice road warrior present, and they're fairly affordable. Perhaps most notable is the new Microsoft Wireless Notebook Presenter Mouse 8000. On the top it's a nicely designed travel mouse, with a laser pointer embedded in the front end. On the bottom there are a number of buttons for controlling PowerPoint presentations or your media player. I like that it has a tilt-wheel for horizontal scrolling and side function buttons. All in all, it's a unique and useful combination. Its $79.95 retail price is on the high side for a notebook mouse, but keep in mind it could save you the cost and space of bringing a separate presentation mouse. As for the ergonomics and tactile feel, I didn't like the skinny scroll wheel's feel under my finger. First, it lacks the intermittent scroll "clicks" which usually aid in controlling scroll movement and help prevent "overshooting" your mark. I also didn't like the tactile feel of the milky-white material used in Microsoft's tiny scroll wheels, nor the hard plastic ridge surrounding the center scroll wheel. It just wasn't as comfortable as it looked, as that ridge kept spreading my fingers apart and felt annoying. The Presenter Mouse 8000 is also a Bluetooth (BT) mouse, which is an advantage if your laptop has built-in Bluetooth; otherwise you'll need to use the separate USB Bluetooth receiver. Keep in mind that BT generally only has a 30-foot range, which may not be sufficient for some presentation locales -- especially in a mouse developed specifically for this purpose. As my laptop doesn't have built-in BT (only about half do currently), and after reading a good amount of online criticism against BT mice performance lags in general (not specific to the 8000), I decided to keep looking. But if you're looking for the most features in one compact device, it should be on your list -- especially if your laptop has built-in Bluetooth. Another good but very pricey mouse is the Microsoft Mobile Memory Mouse 8000. At first glance, it's unconventionally round and squat for a mouse, but don't judge it by its looks. The Mobile Memory Mouse 8000 felt extremely comfortable the moment I put my hand to it and started moving it around -- the ergonomics are surprisingly excellent. It features two programmable side buttons, often used for browsing forwards and backwards in web pages, and they're located in just the right place -- where your thumb can easily press them without ungainly stretching exercises. It also features a battery indicator light and a fully functional scroll wheel. Again, this is just my preference, but it lacks the scroll "clicks" and is somewhat narrow for a scroll wheel. 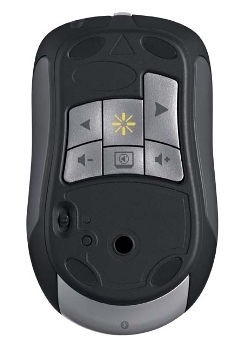 With that said, the smooth top surface of the Mobile Memory Mouse 8000's buttons is a huge improvement ergonomically compared to the Wireless Notebook Presenter Mouse 8000 above -- as there is no hard plastic ridge pushing against your fingers on the Memory Mouse. 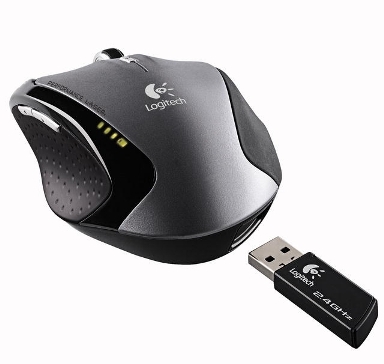 The reason it's named the "Memory Mouse" is that it comes with a 1GB flash memory thumb drive that doubles as the 2.4 GHz radio transceiver. While a nice bonus, 1GB is now at the shallow end of the thumb drive pool, and again, it makes for a noticeably larger USB dongle. While a wonderfully comfortable mouse, Microsoft introduced a puzzling paradox in the "wireless" department. You see, the Memory Mouse 8000 is a rechargeable mouse, which means you need to take its charging cable along or risk it ending up as road warrior road-kill. Thus I greatly prefer replaceable batteries in mobile mice. The good news here is the recharging cable's magnetic connector, à la the Apple MacBook Pro. So if it's accidentally caught or yanked, it'll just pop off the end of its USB dongle. But why? As a wireless mouse should in fact be wire-less, it rather defeats the purpose. All these extras also make this mouse very expensive at $99.95, so while I loved its overall feel, I simply felt there were better and more affordable travel mice available for notebook users. In the "Think outside the box, store it inside the box" category, I was intrigued by the radically different Mogo Mouse. 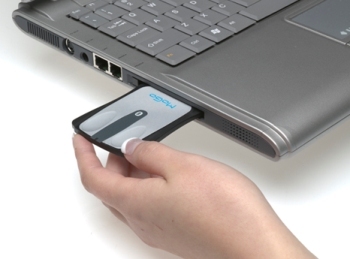 It's extremely thin and shaped to fit inside a notebook's PC Card slot. This saves space, ensures it's always with your laptop, and recharges the Mogo mouse while it's in the slot (only ~40 mins. full recharge time). It features a plastic kick-stand that flips down for use. This elevates the back of the mouse to provide a more suitable angle for your hand. There are two versions of the Mogo mouse -- one for PC Card slots, and another for the differently-shaped Express Card slots found on some newer laptops. It's another Bluetooth mouse, so again you're in luck if your laptop has built-in Bluetooth. If not, you'll need a dongle. Which brings up several of its disadvantages and compromises: The current PC Card model is only a basic two-button mouse, with no scroll wheel or other buttons. However, Mogo now offers scrolling software which adds a scroll function by using button and movement combinations. However, it appears this is actually very old abandoned software initially posted by a Mogo user. It's also only a 500 DPI mouse, which places it at the mid-to-low range of current mouse resolution offerings. This means you'd likely have to move the mouse further to move it smoothly across wider and higher resolution laptop panels. It's usually possible to increase the mouse speed and/or acceleration settings to compensate, but many times that also increases screen "jumpiness" in use. It's also not as suitable for fine detail work, such as working with images. I'd need a BT dongle, and due to the Mogo's slimness, you can't store the receiver inside the mouse itself. In addition, I was concerned with the durability of the plastic kick-stand. While it's an innovative storage and charging design, overall the Mogo came across as a bit too gimmicky for my needs. With the slot type dependency, there's a chance you'll need to buy the other form factor if you get a new laptop with a different card slot, but that would be down the road. In contrast, external cordless USB mice would be more freely transferable to newer laptops. At least Mogo is planning to provide arguably the world's smallest Bluetooth adapter in the Mogo Dapter. 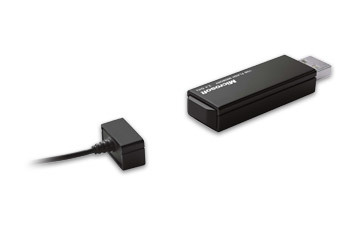 It's a tiny, rounded, and speedy Bluetooth 2.0 and USB 2.0 adapter you can leave plugged into your notebook. Announced earlier this year, it doesn't appear available yet. When I started writing this review, the Mogo web site stated it would be available "Fall 2007". Apparently, it's now pushed back to "January 2008". As it was initially slated for release within Q2 2007, it should be very useful whenever it gets released, supposedly for a $49.99 MSRP. Let's hope with all these delays it's not just another vaporware product. Honey, I Shrunk the USB Dongle! Brand new is the Logitech VX Nano, so named for its smaller size and tiny USB receiver. I really, really wanted to like the new Logitech VX Nano. It has the world's smallest USB receiver, which is so incredibly tiny you can just leave it in your notebook's USB slot and forget about it. Logitech has raised the bar significantly on this feature alone, and it's likely only a matter of time before other manufacturers follow its lead. The Nano also stores the receiver inside the battery door on the bottom of the mouse. Unlike last year's VX Revolution, storing the wireless receiver does not turn off the VX Nano, so you'll need to use the power button on the bottom of the mouse. Ejecting the USB receiver also requires you to first remove the battery door. I'd expect most people will simply leave it in their notebook's USB port assuming they have one open. The VX Nano mouse is noticeably smaller than last year's VX Revolution, both in thickness and length. It's compact design means it takes up less space in a crowded bag, and it has the cool Logitech free-spinning scroll wheel for hyper-fast scrolling through long documents, spreadsheets, and web pages. No longer do you have to flick a switch under the mouse to change scroll modes from the clickety-kind to the free spin as was needed for the VX Revolution. Simply push down on the scroll wheel to toggle the spin mode -- great for changing on the fly. It takes two AAA batteries and battery life is estimated at six months with occasional use. Heavier users can naturally expect less, but this is a long time for a cordless mouse. Unfortunately, Logitech had to make a number of compromises to fit all this goodness into such a small space: Gone is the beautifully curved and ultra-comfortable right-handed ergonomic contour from the prior Logitech VX Revolution notebook mouse. Also gone is the VX Revolution's programmable zoom button. While the new ambidextrous design is certainly better for lefties, the VX Nano is not as ergonomic since it requires a claw-like grip. That's fine for short usage, but it's not as appealing for longer stretches. It's so slim height-wise that Logitech moved the forward/back buttons away from the thumb rest and placed them on the extreme upper left corner by the left mouse button. That made them difficult to reach, requiring a very unergonomic finger "stretch maneuver". These two buttons are made from a rubbery material instead of hard plastic (as on the Revolution mouse), so you don't get as much of a tactile response. The nice 4-stage battery meter of the Revolution was replaced by a single LED on the Nano. Last but not least, the smaller redesigned scroll wheel has a looser, sloppier feel compared to the Revolution's larger wheel -- particularly when pushing it left and right for horizontal scrolling. However, I liked the smaller wheel's size itself, which was more appropriate for a compact travel mouse. All in all, I could probably live with these drawbacks due to its more compact size and wonderfully tiny receiver, but the real deal-breaker for me was that the VX Nano's scroll wheel cannot function as a middle mouse button. Clicking down on the wheel only changes the wheel's mechanical spinning mode. I caught myself automatically clicking the wheel out of habit. Since I'm a multi-tasking power user, particularly with tabbed web browsers, losing the the middle click button was a tougher item to ignore. The ability to use it to open and close web links in a new tab is a key productivity feature that I just wasn't willing to sacrifice -- especially as I use the middle click button far more often than the free-spinning scroll feature. FYI, the bundled SetPoint software can be used to reassign one of the other buttons (e.g., the search button) to become the middle click button -- a change that will take some time getting used to. Overall, it's a good travel mouse with some extra features and buttons, a travel pouch, and the tiniest USB receiver to date, so it's very worthy of consideration. It's certainly one of the better cordless mice in its size class and has a nice "executive" look, but I recommend you try it out in the store before you buy. 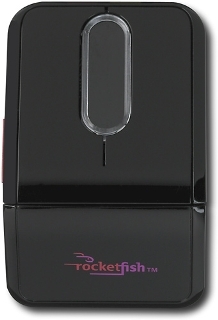 An interesting contender presented itself from a very unlikely brand -- the RocketFish Twister Wireless Laser Mouse. 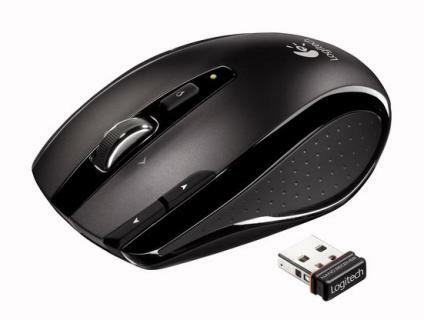 RocketFish is Best Buy's house brand, and the Twister Mouse is extremely compact yet quite usable. The built-in twist is simply brilliant. The mouse stores flat, and I do mean flat, in an included travel pouch. Give it a quick twist, and it adds the necessary curve for use. For an animated demonstration of the "twist", view the 360º image. To keep its low profile, it substitutes a flat scroll touchpad where the scroll wheel would be, and underneath that is a clickable middle mouse button. 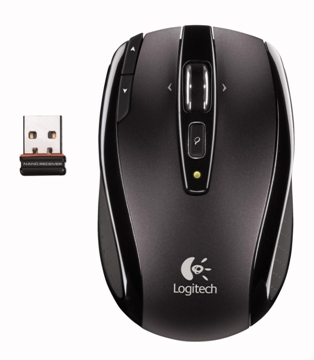 Other features include a diminutive USB receiver dongle that stores right in the mouse. 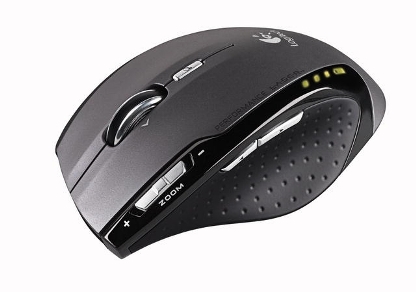 I prefer mice such as this that not only store the receiver inside, but which automatically turn the mouse on/off when ejecting or reinserting it back in the mouse to save battery power. 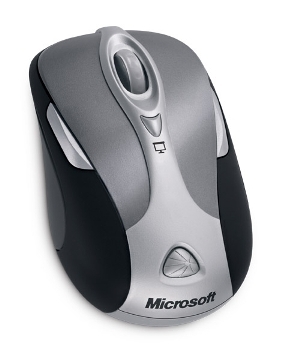 The Twister mouse includes an extra button on the left side, nice for clicking "back" when web browsing, and bundled software for reassigning button functions and adjusting mouse performance. The Twister Mouse's flatter design is perfect for extremely crowded laptop bags and it easily fits in nearly any pocket. I discovered another great use as a wireless presentation mouse -- the mouse buttons are the perfect size, but just don't touch the middle scroll pad unless you want your slides to advance very quickly. Its wireless range could be a bit better, as I only got roughly 20-30 feet away on fresh batteries before responsiveness dropped off. So it's best suited for small to mid-sized presentation rooms, or where you won't be moving far from your notebook. Note that the mouse buttons operate in either twist mode, so you can use it to present in your hand with it flipped flat as desired. Another tip: Change PowerPoint's setting to uncheck "Show menu on right mouse click." This allows you to use the second mouse button to go back a slide without popping up PowerPoint's annoying navigation menu. Now for the reality check: It took time before the Twister's unconventional shape felt more natural in use. It's boxy, but usable. The middle scroll touchpad is innovative, but requires a heavier touch for the desired responsiveness. It's a shame its touchpad sensitivity is not currently adjustable in the bundled software, which would help make it feel more fluid and require less effort. The left and right mouse buttons are fairly quiet and have a very short click depth. This makes them quicker to click, but it's an acquired taste. The red side button is also too slim and recessed for easy clicking. I had to consciously apply more pressure to make it click. However, since many notebook mice don't even have an extra button, this was at least a thoughtful and somewhat useful addition. The Twister Mouse features a "Connect" button on its bottom should its USB receiver not automatically recognize it. This occurred on occasion: several times upon insertion of the USB receiver into the laptop (easily cured with the "Connect" button), and once after the mouse was left inactive for 30+ minutes. Unfortunately, the "Connect" button did not solve the latter problem, but removing and reinserting the USB receiver did the trick. So it wasn't a seamless connection throughout, which could cause problems before a big presentation and/or potentially frustrate a new cordless mouse user. Battery-wise, it takes two AAA's and both the USB receiver and the mouse will light up in various colors indicating relative battery strength. I prefer a multi-segment meter, or at least a percentage indicator in the included mouse software, but it's better than nothing to avoid a dead rodent. Bringing or buying spare AAA batteries on the go is easy enough, and for that reason I prefer replaceable batteries over internal rechargeables for notebook mice. Compared to Logitech's and Microsoft's offerings, the Twister Mouse doesn't compete in refinements, but it's more reasonably priced, functional, extremely compact, and is still somewhat comfortable in use despite its small and boxy size. If you're looking for a tiny mouse to use on an airline tray and have a cramped laptop bag, consider the Twister Mouse or the Logitech VX Nano above. When it came down to it, my favorite cordless notebook mouse is the Logitech VX Revolution. It's not the smallest, but if you're looking for a single cordless laser mouse to use while traveling and also as a desktop mouse, this is the one. It's elegant, extremely comfortable, and incredibly versatile. If you do a Google search for VX Revolution review, you'll find many highly positive reviews. Logitech did a superb job in designing this mouse. The Revolution is so-named for its innovative dual-mode scroll wheel. Flicking a little switch on the bottom changes its function from the clickety-kind to a nearly frictionless free scrolling wheel -- perfect for long documents, web pages, and even longer spreadsheets. Its long radio range is phenomenal, and its 2.4 GHz frequency worked beautifully along with all of my Wi-Fi devices -- no interference either way. I also like the deep comfortable thumb rest and the proper location of the forward/back buttons just above it, so they're very easy to reach. It has just the right tactile feedback as well, giving it a very polished and refined feel. However, it's not ergonomic for the left-handed, who will likely want an ambidextrous design. What's extremely rare for a notebook mouse is that the VX Revolution has a whopping 7 physical buttons. 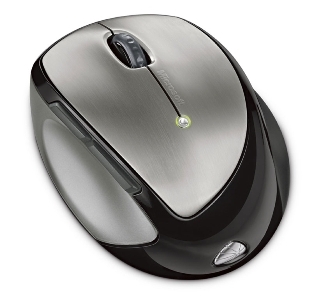 Considering that the scroll wheel and zoom buttons have multiple positions, it's more like a 10-button mouse. The well-designed Logitech SetPoint software makes each button very customizable. For example, you can assign unique button functions for different programs, and one of the options is a "document flip" which supports Vista's new 3D window flip feature. While not as tiny as the VX Nano's USB receiver, I rather like that the VX Revolution's receiver is fairly small (about half the size of most Microsoft USB receivers), and it slides into the mouse for easy storage. Popping out the receiver automatically turns on the mouse, while reinserting it powers it off -- so you won't accidentally have a dead mouse in your bag. The single AA battery is also cheap and easy to replace on the go. Battery life is slated at four months, but will naturally vary with usage. I'd say the VX Revolution only has two drawbacks: First, it's a slightly larger and thicker notebook mouse, due to the higher but extremely comfortable ergonomic palm curve. The other is you'll have to flip the mouse over during use to flick the microgear switch to change its mechanical scroll wheel modes. However, as the VX Nano above demonstrates, smaller isn't always better, and I'll gladly make a little extra room in my laptop bag for the VX Revolution. It doesn't come with a travel pouch, so a quick trip to my local Best Buy matched me up with a nice Lowepro Ridge 30 case that fits it perfectly and is lined in soft brushed-tricot to prevent scratches. As the Logitech VX Nano is the newest model, the VX Revolution's price has begun to drop. I've also recently seen a number of rebates at online stores if you're so inclined. The rebates may signal a phase-out in favor of the newer, smaller Nano. So if you if want a Revolution, you might want to give it a spin before they're gone.